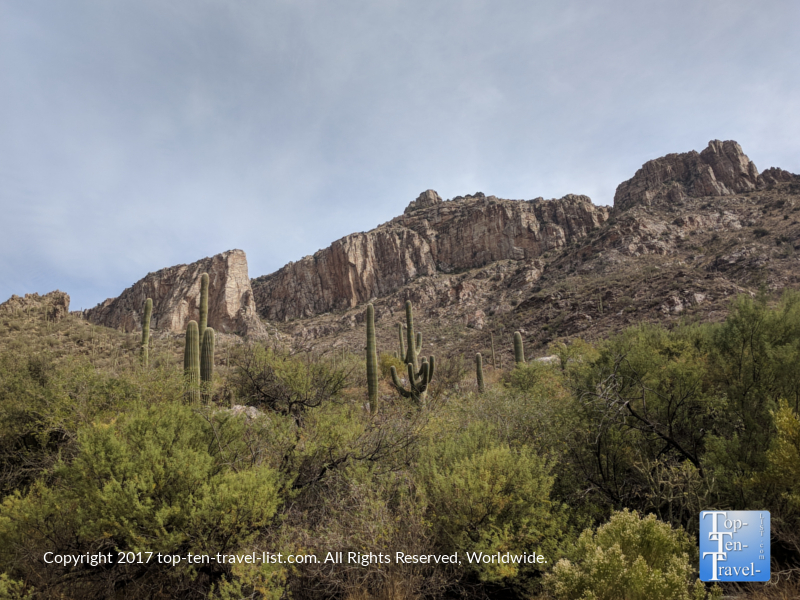 Attraction of the Week: Sabino Canyon in Tucson - Top Ten Travel Blog | Our experiences traveling throughout the US. 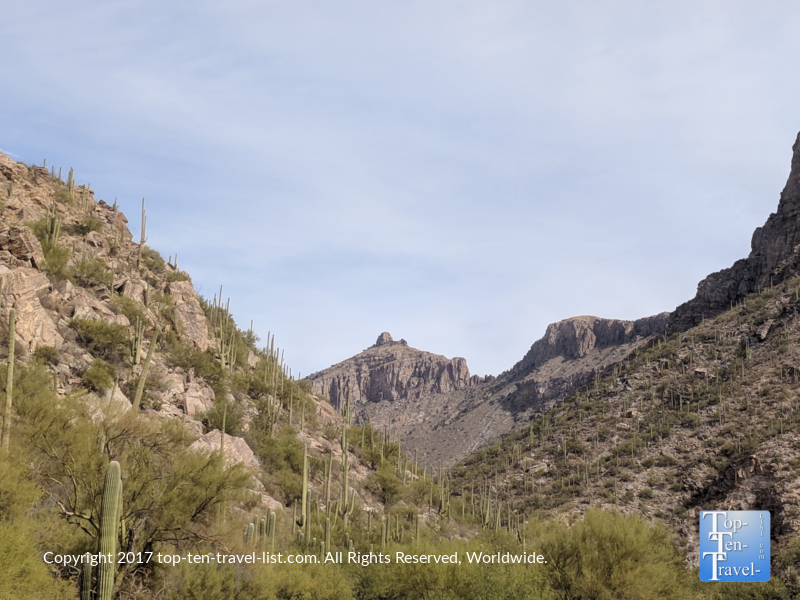 Sabino Canyon is a desert oasis amidst the never ending suburban congestion in Tucson. This is the place that both locals and tourists flock to for a relaxing natural escape from the never ending traffic, stoplights, and retail businesses. As soon as you enter the canyon, you are transported out of the city into a desert wonderland. 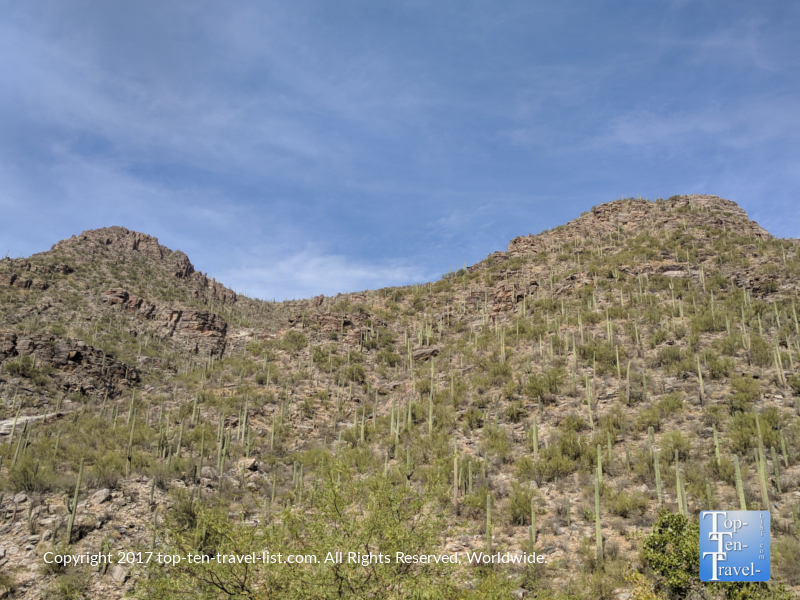 Anyone who loves the unique beauty of the desert, including the native stately Saguaro cactus, will definitely want to plan for a stop at Sabino. Because of its’ beauty and rustic nature away from the city, Sabino has become one of the Southwest’s most popular tourist attractions. Unfortunately, it’s getting more and more crowded by the year, however, that does not take away from the natural beauty completely. Sabino still remains one of the top things to do on any Tucson vacation. Various hiking trails,ranging from easy nature strolls to all day long adventures, and a scenic tram ride (currently out of operation as of Sept 2018) give the opportunities for nature lovers and fitness buffs alike to experience the beauty of the canyon. 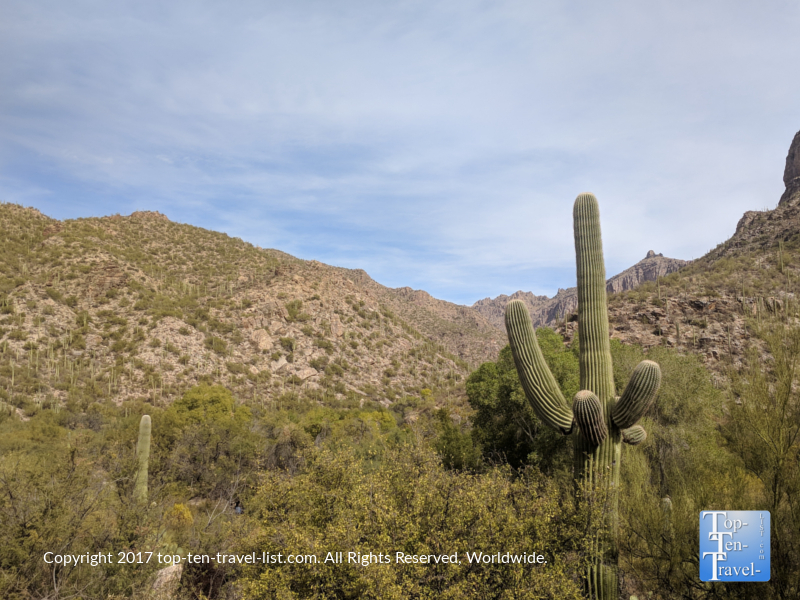 Sabino Canyon is located within the Santa Catalina Mountains (part of the Coronado National Forest) at an elevation of 2754 feet. The highest point in the range is Mt Lemmon at 9157 feet. Pools and creeks, as well as small waterfalls, are often seen after heavy summer monsoon storms or after the winter snow melts. The 4 mile hike to Hutch’s pool is very popular during Tucson’s hot months as it is one of the larger swimming holes. Note: avoid monsoon season due to the possibility of flash floods! Sabino is home to a surprising lush variety of plant life not typically pictured when envisioning a desert environment. If you hike the short nature trail behind the visitor’s center, you will learn more about the diverse plant life via helpful interpretative signs. 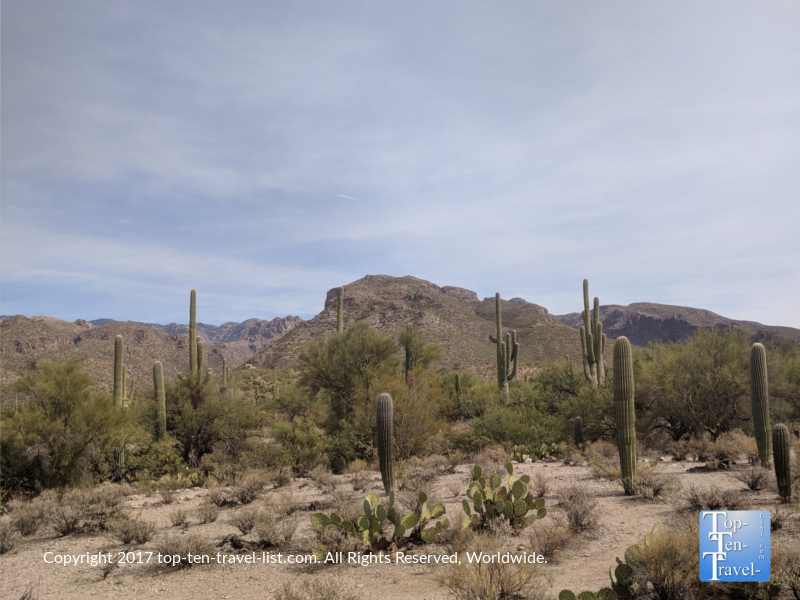 The Sonoran Desert is considered to be the greenest in the world with 3-15 inches of rain per year mostly during the intense summer monsoon season. Dozens of varieties of cacti, along with Palo Verde and Mesquite trees, can be found everywhere. In the fall, you will even be treated to a bit of golden foliage courtesy of the cottonwood and sycamore trees. Trams have been transporting visitors up the canyon since 1975. Note: As of Sept, the rides are temp closed. Cars are restricted, so you can only reach Upper Sabino Canyon by foot, bike, or tram. The ride is a bit pricey at $10 per person, although a relaxing way to take in the beautiful views. 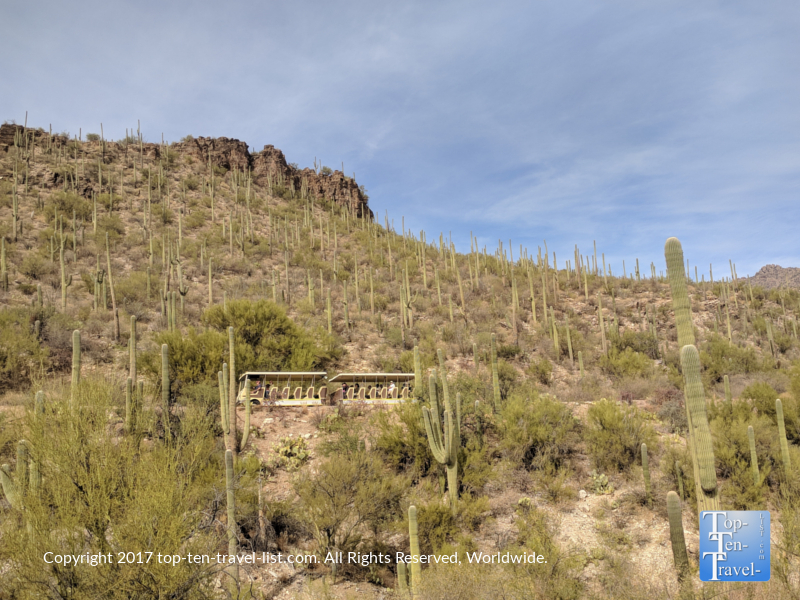 The tram tour is a narrated 45 minute ride with 9 stops in which you can get out and explore various hiking trails, picnic, check out the seasonal pools, or simply take photographs. Trams arrive every 30 minutes or so, so it’s easy to hop on and off at any point. If you prefer to work up a sweat, the 3.5 mile paved road is a challenging, scenic trek. You will get in a great invigorating workout while also taking in outstanding views of the canyon. The trek up is moderate with numerous hills, although not quite as bad as you would think. The intense heat and overall length of the hike is what makes it a bit difficult. Be sure to arrive early to beat the heat and avoid summer visits if possible! Numerous small streams and waterfalls as well as an abundance of wildlife (coatimundi are frequently sighted!) give the canyon a really unique look. Many cyclists and joggers also love getting here early in the AM to enjoy the trail before the hot sun starts beating down. A view of the paved road which you can walk as opposed to taking the tram. A bit hilly on the way up, but a nice relaxing trek downhill and great views make up for any extra effort! Whether you go with the tram ride or decide to challenge yourself to a stroll up the paved path, the views are beautiful all along the way and you may even see some wildlife in action. We were lucky enough to see a coati (a racoon relative which inhabit desert canyon areas) and a western diamondback rattlesnake during our visit, from the safety of the tram of course! Javelina, mountain lions, desert tortoises, and White Tailed Deer are also occasionally seen. 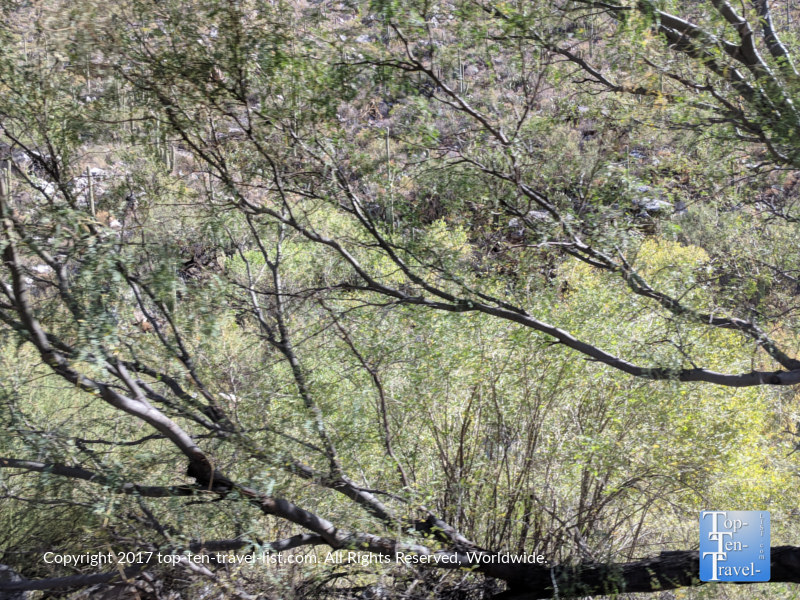 Sabino is also a popular destination for Arizona bird watchers, although you really have to bring binoculars to see much. Watch your step! 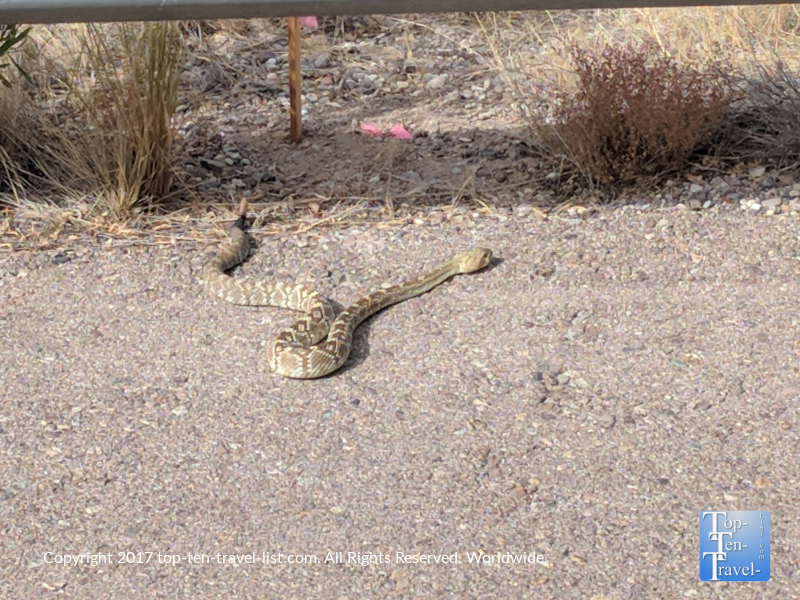 Rattlesnakes are frequently sight, both on the trails and the main paved road! For those up for a real desert adventure, take the Bear Canyon tram (non-narrated) to the Seven Falls trailhead. 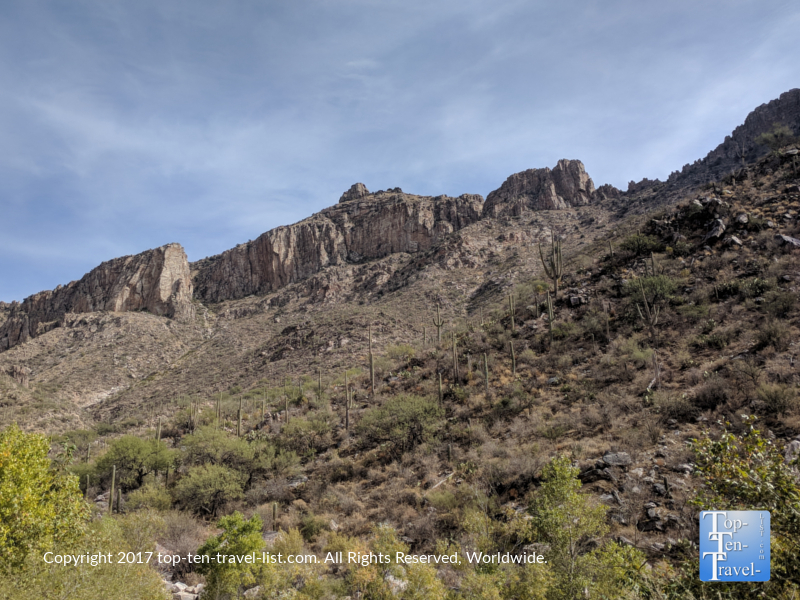 The presence of multiple natural pools and a nice seasonal waterfall (for a desert), make the Seven Falls trail one of the more popular hikes in Southern Arizona. The trail is 5 miles round-trip, although the journey feels much harder due to the the harsh conditions of the desert, multiple creek crossings, and boulder hopping. Plan to visit outside of the summer season due to the brutal unending 100+ degree heat. Also, bring with plenty of water (I use a camelbak) and plenty of snacks. Dehydration is a real concern in the desert – do not take it lightly! Some avid hikers prefer to forgo the tram in exchange for a really intense 8.2 mile hike, although you must be thoroughly prepared for such a feat. The best part about visiting Sabino is all the gorgeous Saguaro cacti you will see. 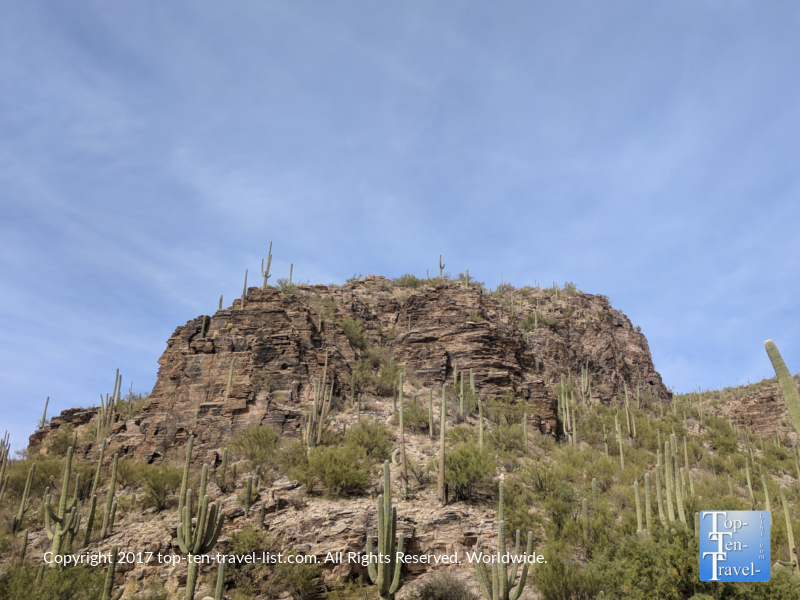 Apart from Saguaro National Park, it’s one of the best places in Arizona to see tons of cacti. There are many great places to hike in Arizona, with Sabino being a great choice for tourists seeking a nice maintained paved trail. If open, I recommend enjoying the leisurely tram ride where you will get to take in the beauty of the Sonoran desert, learn some unique new facts about this rare ecosystem, and possibly even see some wildlife. *Bring with plenty of water bottles. Or, better yet, wear a camelbak for easy access. *Visit outside of the hot summer season. 100+ degree and sunny skies is way too hot for any type of hike, pools or not. *Visit on a weekday to avoid the crowds. At times, it can be very difficult to find parking. *Eat a full breakfast prior to your arrival. There is no food on-site and most of the year it is too hot to enjoy a picnic. Brewd, a local coffeehouse, is just a mile or so away and serves tasty quiche, pastries, and light breakfast entrees, along with a full espresso menu. *Remember that you are in a harsh, dry desert climate. Drink more water than you are used to and be sure to eat salty snacks to replace lost electrolytes. *Bring with sunglasses and a hat to block some of the harsh rays. 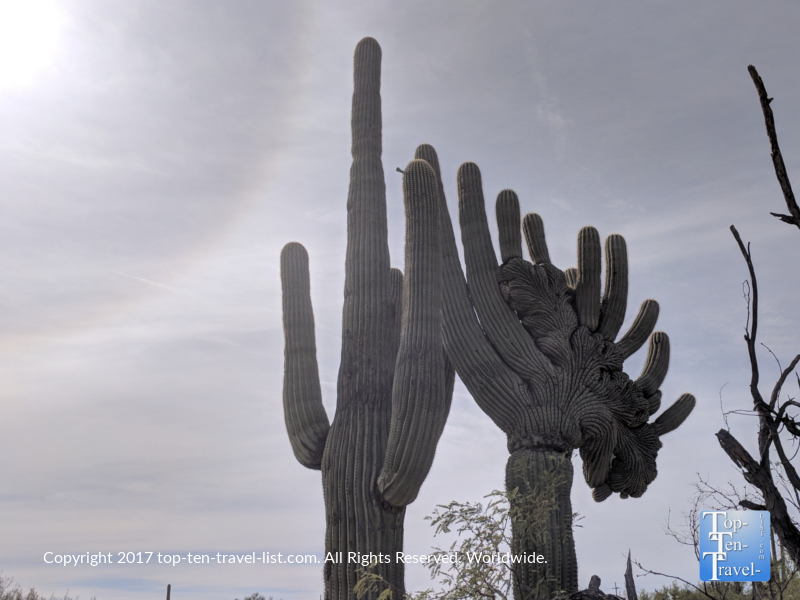 *Bring with your camera – there are lots of great photo opps, especially of the magnificent Saguaro cactus. *Bring with cash for the tram ride (no credit accepted). Rides are $10 per person. *Do not let the short distances of the hikes fool you. Hiking in the desert is no easy feat with the intense sunshine, many rocks to climb over and prickly plants to avoid, and risk of dehydration. I recommend hiking a much shorter distance than you are accustomed to on your first visit. *A first aid kit should always be on hand especially if you get stung by a cactus. From personal expeience, you will definitely want to try avoid brushing into these sharp needles which are a pain to take out. Ouch! *Watch out for rattlesnakes and other dangerous wildlife. Keep a safe distance. Sabino Canyon is located at 5900 N Sabino Canyon Rd, Tucson, AZ 85750. 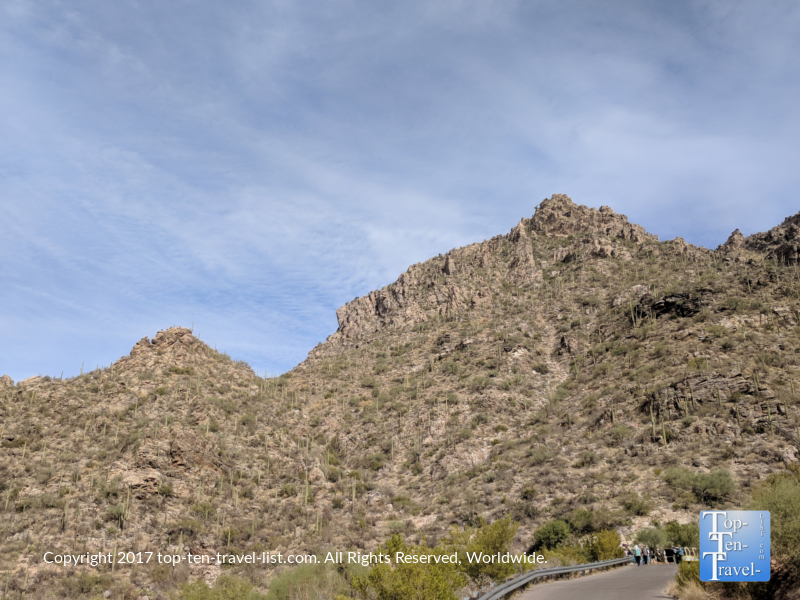 The Sabino Canyon narrated tram is $10 adults, $5 for children (2 and under free). The Bear canyon tram is $4 per adults, $5 for children (2 and under free). The visitor’s center is open 8:30am-4:30pm. The Sabino tram has summer & winter hours. Summer hours are 9am-4pm (Mon-Fri) and until 4:30pm on weekends & holidays. Winter hours (mid Dec-June) are 9am-4:30pm. Trams run every half hour. The Bear tram is open at 9am and runs every hour until closing. Open every day besides Thanksgiving and Christmas.